Are Parents Ruining Youth Sports? It’s important for parents to support and encourage their children’s interest and participation in sports (or any other endeavor). Sit in the stands and cheer for your kid(s). Provide the means — within your means — for their participation based on their interest. Be a conduit to their learning and having fun playing the game. And, while most parents (and coaches) “get it,” there’s a growing vocal minority whose behavior is ruining athletics for everyone involved. 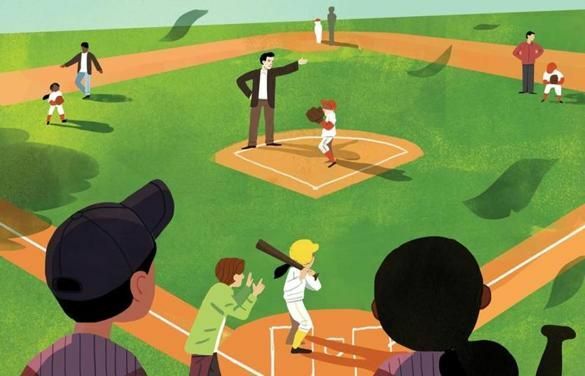 These obsessive, over-involved adults have unrealistic expectations of their children’s ability and potential, operating under the misguided notion that their kids’ games are a miniature version of grown-up competitions, where the goal is to win. Some families are overly preoccupied with finding a private batting instructor, a summer hockey program, an expensive soccer camp, or that special coach who can help their pre-pubescent child improve their jump shot. This is often an ill-advised attempt to accelerate a process that may not even be occurring, since most young athletes will never reach the elite level. The fact is, only about 1% of high school athletes will receive a Division I scholarship. You can hire private coaches, but you can’t buy love. Kids who passionately love their sport are children who won’t have to be nagged to practice. They’ll go out and shoot basket after basket, simply because they want to. That can’t be bought or forced. Some parents “volunteer” to help their child’s team — keeping stats for the team, spotting for announcers, etc. — in a thinly veiled attempt to gain closer access so they can yell instructions to their child, which usually conflict with the coach’s. They call, text, and email coaches about their child’s playing time and blame everyone else if their child fails. Part of the problem is that these parents are living vicariously through their children and their expectations are unrealistic. They also may feel entitled because of the investment they’ve made in their kid’s sport participation. And, of course, they think their child is better than they actually are. They become so emotionally invested in their child that their own identity is linked with their children’s athletic endeavors. Ultimately, the biggest contributing factor is the financial and emotional over-investment some parents have with their children. Because youth sports have become about everyone getting an orange slice and a participation ribbon, parents aren’t used to seeing their child on the bench. They expect them to start because a parent usually thinks their kid is better than they really are. They see another player getting a scholarship to a college and think their kid should too. Youth sports are expensive. When participation becomes year-round, they’re even more expensive. When parents invest a considerable amount of their disposable income in their kid’s athletics — and expect a certain return on that investment (playing time or scholarship) — they’re setting themselves up for disappointment. The emotional over-investment is a big problem. Since youth sports have become this year-round “industry,” parents spend years shuttling their kids to practices, games, and tournaments. All of their free time is consumed by their child’s sport. Their identity is linked with the child, and they spend most of their time with parents in the same situation. They live in a bubble with blinders on. So when their child is benched or cut it’s the coaches fault. It’s impossible for them to believe that their child has athletic shortcomings. As parents. we all want the best for our children. But there are ways to do that other than making everyone else’s life miserable. If most of these players knew how their parents were acting, they’d be embarrassed. A child gains nothing if they’re playing because of their parent’s influence. They benefit more if they’ve earned it. In fact, perhaps they could gain even more if they don’t start. Life is that way. It’s unfair at times. It doesn’t always reward hard work. It doesn’t entitle anyone to anything. You don’t always get what you want. To exert your influence and prevent your kids from experiencing this early in their lives will almost certainly handicap them in the real world where, more often than not, it doesn’t matter who your parents are. If you don’t allow your child to fall, how will they ever learn to stand on their own two feet? Some families are overly preoccupied with finding a private batting instructor, a summer hockey program, an expensive soccer camp, or that special coach who can help their pre-pubescent child improve their jump shot. This is often an ill-advised attempt to accelerate a process that may not even be occurring, since most young athletes will never reach the elite level. The fact is, only about 1% of high school athletes will receive a Division 1 scholarship.